Papers: 1968-1994, 101 cubic feet. The Hamilton Fish, Jr. papers contain photographs; film, sound and video recordings; scrapbooks, and ephemera, including awards, official passes and campaign buttons. The collection is divided into ten series. The first series documents the personal activities of Representative Fish and his family. 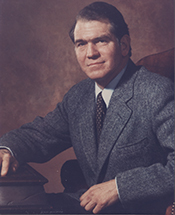 Following this series are five series (Legislative files, Nixon Impeachment files, Correspondence files, Subject files and Press/Constituent Relations files) which document the work of Representative Fish and his staff. The seventh series (Political files) includes material representing the Congressmans political activities. The eighth series (Photographs) along with the ninth (Audio/Visual files containing audio tapes, film, video tapes, and floppy discs), and tenth (Scrapbooks, Ephemera and Artifacts), contain non-paper material, all of which adds depth to the paper records in the collection. A finding aid is available in the repository and online. Papers: In the Fish Family Papers, 1785-1936, 1 box. Persons represented include Hamilton Fish.